T-Mobile USA will exempt a list of video streaming services from monthly data caps with Binge On, a feature that could let some subscribers watch more clips and shows without buying a more expensive plan. Those users will have to be happy with DVD-quality video, though, because that's all they'll be able to get on those services if they switch on the Binge On setting. The feature will be available for free starting Nov. 15 for any subscriber with a monthly data plan with 3GB or more. It includes Netflix, Hulu, Sling TV, ESPN, Major League Baseball and 19 other streaming services. But subscribers will have to turn it off if they want to watch any of those in HD, which means they'll be eating into their monthly data plan. Binge On comes with a virtual toggle switch so users can go back and forth as they wish, T-Mobile President and CEO John Legere said at a launch event streamed online. The service is the latest product from the nation's third-largest cellular operator that's intended to disrupt the mobile business. It goes after the prime category of content for carriers and the one that slurps up the most capacity on their expensive high-speed networks. It could pull more consumers to a carrier that has been gaining subscribers and recently surpassed Sprint on that measure. Not counting certain content against data caps has raised net neutrality concerns among some critics who worry the practice could give entrenched content providers an edge over new and smaller competitors. T-Mobile says no streaming service is paying for placement in Binge On and the only requirement on them is to meet some simple technical standards. However, common sources of video including YouTube and Facebook aren't covered under Binge On. T-Mobile says it has advanced software to distinguish video from other types of data but it can't pick out certain kinds of streams, such as those that use the HTTPS secure Web format. When that's the case, the content provider needs to mark its video so T-Mobile can identify it. T-Mobile expects more video content suppliers to join. The carrier's Music Freedom service, introduced earlier this year, has grown to cover more than 95 percent of music streaming services, the company said. Legere dismissed concerns over the limit to DVD quality, saying the resolution of 480p is perfectly good for viewing on a mobile device and users can deactivate Binge On when they want to stream video from their phone to a TV. When there's Wi-Fi available, streams will automatically switch to that network and users will be able to watch in HD without cutting into their cellular data cap, T-Mobile says. 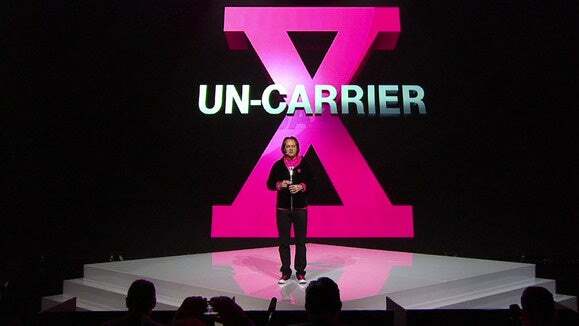 The carrier is exploring new compression technologies that should allow higher resolution with the service in the future, said Neville Ray, T-Mobile's CTO. Subscribers who still have unlimited data plans also benefit from Binge On, because it gives them unlimited streaming when using the phone as a mobile hotspot, T-Mobile says. Starting in January, those subscribers will also get one free video rental per month from the Vudu service. Consumer advocacy group Free Press said the new feature solves a problem T-Mobile created by imposing monthly data limits. “If offering exemptions is so easy for T-Mobile, why do we need the caps in the first place?" Free Press Policy Director Matt Wood said in a prepared statement. "Exemptions for selected streaming-video services prove there’s no legitimate reason to impose data caps."